Christ Church, with its beautiful location in a stunning garden and the historic St Nahi's, both close to a major transport hub, are wonderful churches for a wedding. If you are interested in being married here please contact us as early as possible for an appointment to see the Rector and discuss your plans. There is a good deal of helpful information about Anglican marriage on the Church of England website However, specific rules apply to some churches in the Church of Ireland and the following may help you in making a decision about being married in Taney. Who is eligible to be married at Taney? Couples who are resident within the parish boundaries have the right to be married in their parish church. If you do not live in the parish, you may still be married here if one or both of you worship regularly at the church in the period preceding the proposed wedding date. In all cases at least one of the couple must have been baptised. If you are not resident in the parish and do not think you would be able to make the regular worship commitment outlined above, but have a connection with Taney in some other way and would like to be married here, it may still be possible under special circumstances. Please speak to the Parish Secretary or the Rector to see whether you might qualify. When can we be married? 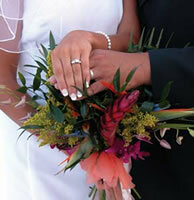 Saturday is the most popular day for weddings but other days can be considered. Our regular services are on Wednesday and Sunday so these times should be avoided. It is not normally allowed for marriages to take place during the season of Lent (the 40 days prior to Easter), although exceptions may be made. Marriages can take place in law at any time between and 8.00am and 6.00pm, and a marriage service normally lasts about three-quarters of an hour. The cost of being married in church, as with all other aspects of weddings, can vary enormously depending on how elaborate your plans are. All the relevant costs will be explained to you when you meet the Rector. Contact the Parish Secretary (info@taneyparish.ie) to arrange a meeting with the Rector. When you see him he will let you know whether it will be possible for you to be married at Taney, and if it is he will give you a brochure with all the information you need about the various aspects of planning a wedding here. We look forward to helping you with your wedding plans!